Astute Solutions is a throng of customer service and knowledge management solutions designed for consumer-centered enterprises. Their offerings consist of the ePower Center (customer engagement and issue resolution), Astute Social (social media management platform), Astute Knowledge (knowledge management software), and Astute SOS (multi channel customer support platform). 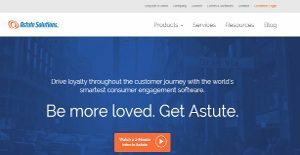 Astute Solutions aims to encourage and steer customer loyalty via the world’s smartest and most intuitive consumer engagement systems. All systems by Astute Solutions are designed to seamlessly connect businesses with their consumers using the leading edge technologies. By eliminating points in the business-consumer relationship that causes friction, Astute Solutions delivers a string of platforms that makes communication between businesses and their clients enjoyable, insightful, and productive. Top features include: artificial narrow intelligence, natural language processing, omni-channel engagement, unified customer view, and many others. To make matters even better, Astute Solutions is priced by quote, meaning that you will only pay for what your company genuinely needs. ePowerCenter, Astute Solutions’ customer relationship management offering, delivers a system that enables contact center agents to resolve issues faster and more effectively. The software is designed to be user friendly so as to reduce training time, and delivers a unified customer view for agents, allowing them to see everything so they can deliver effective solutions and answers to customer issues and queries. Astute Social media management platform gives businesses that capability to truly know customer sentiments, not just trends and figures. With effective sentiment monitoring and natural language processing, users are able to discern rants from praises and them proceed to engage them appropriately via ads, web content, product innovation, and more. Not only that, Astute Social allows users to predict market behavior as well. With Astute Knowledge, businesses have a powerful and intelligent knowledge management solution. The system allows users to deliver intelligent responses to individual customers without ever having to author a knowledge base from zero. Astute SOS ensures that all customer support interactions and transitions from one channel to another remains painless and devoid of friction. With Astute SOS, agents can cater to their customers via chat, voice, and video without requiring their clients to retell their story. Asture Solutions boasts of an extensive list of benefits that puts your business on top and ahead of the competition. With its natural language processing, omni channel engagement, agent guidance, and unified customer view to name some, there is no doubt why international brands choose Astute Solutions over the alternatives. Companies have unique needs and requirements and no software solution can be perfect in such a scenario. It is pointless to try to find an ideal out-of-the-box software product that fulfills all your business needs. The intelligent thing to do would be to customize the application for your special requirements, employee skill levels, budget, and other aspects. For these reasons, do not hasten and subscribe to well-publicized popular solutions. Though these may be widely used, they may not be the best fit for your unique requirements. Do your research, investigate each short-listed platform in detail, read a few Astute Solutions reviews, call the vendor for clarifications, and finally select the application that provides what you want. How Much Does Astute Solutions Cost? We realize that when you make a decision to buy CRM Software it’s important not only to see how experts evaluate it in their reviews, but also to find out if the real people and companies that buy it are actually satisfied with the product. That’s why we’ve created our behavior-based Customer Satisfaction Algorithm™ that gathers customer reviews, comments and Astute Solutions reviews across a wide range of social media sites. The data is then presented in an easy to digest form showing how many people had positive and negative experience with Astute Solutions. With that information at hand you should be equipped to make an informed buying decision that you won’t regret. What are Astute Solutions pricing details? What integrations are available for Astute Solutions? If you need more information about Astute Solutions or you simply have a question let us know what you need and we’ll forward your request directly to the vendor.